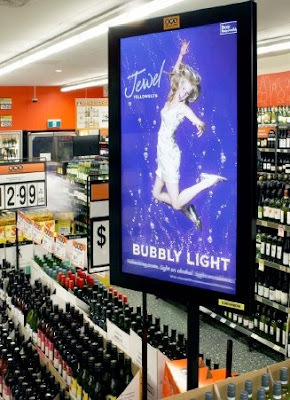 Attention impulse shoppers: One of the few bright spots in the ad industry is now digital out of home (OOH), which covers everything from giant glowing billboards over the interstate to digital signs above store cash registers. Digital OOH spending was up 24% in 2007 and is tracking to 11.2% growth in 2008. Patrick Quinn, chief of PQ Media, recently told Mediaweek that digital signage should fare better in the economic downturn than other media channels. Why? Fragmentation of traditional media makes breaking through on TV, radio or print problematic. Digital signage at the point of purchase is unavoidable, and can influence consumers in “the last 3 feet” before they reach for their wallets. A recent study by Point of Purchase Advertising International found that 70% of all buying decisions are made in the store and 43% of consumers can be influenced at point of purchase. Of course, if you believe everything a point of purchase advocacy group says about point of purchase advertising, you’ll probably be influenced by signs at the cash register, too.